The fanfare will be reprised tomorrow at the Wheaton band's 7:30 p.m. concert in Memorial Park at 208 W. Union Ave. in Wheaton, Ill. The music was premiered in July, leaving its namesake misty-eyed. "It was deeply moving," Friedmann told Suburban Life. "I was kind of an emotional wreck the rest of the concert. It's humbling and it's an incredible honor to have a new piece of music commissioned in your honor." 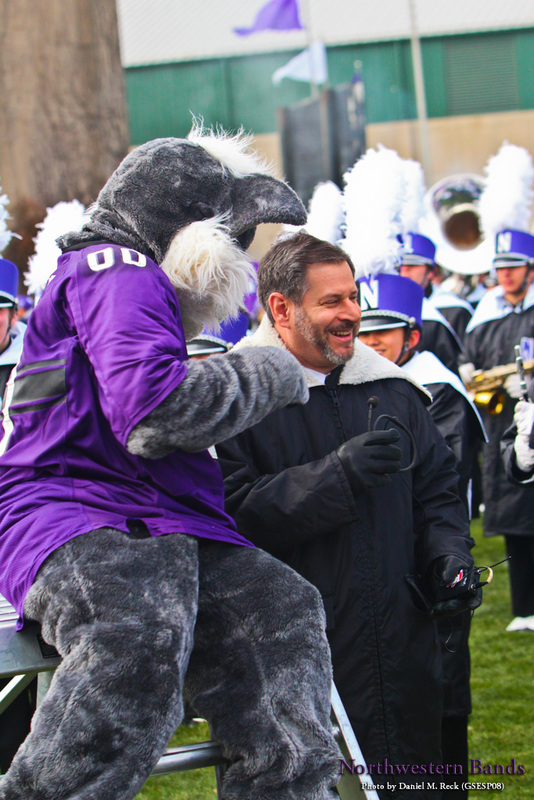 When he's not announcing for the Northwestern and Wheaton bands, Friedmann is an independent consultant in public relations, marketing, and communications, and is also a recognized announcer and voiceover artist. He started his career as a broadcast journalist for WJOL-AM/WLLI-FM in Joliet, Ill. In 2011 he became the Voice of Northwestern Women's Basketball, and recently became the back-up announcer for the WNBA's Chicago Sky. 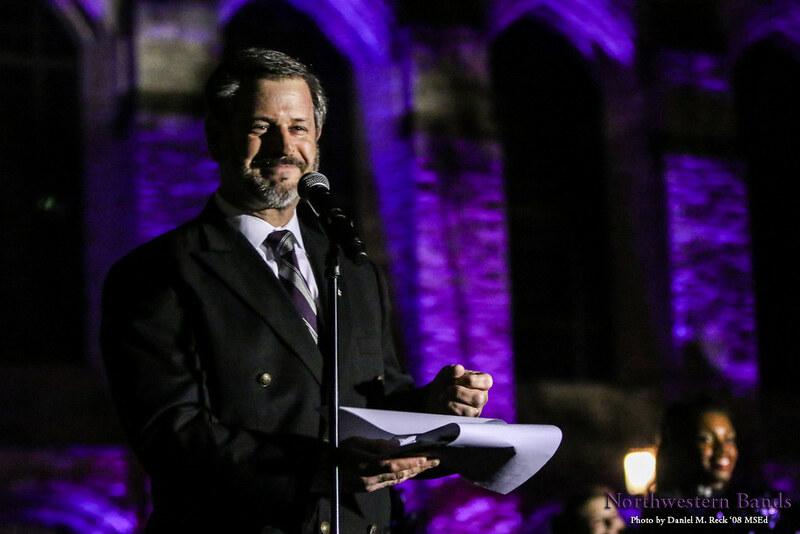 "I can't say thank you enough, Pete," said Daniel J. Farris, director of athletic bands at Northwestern, at the band's annual banquet last November. Addressing the band students, Farris said, "He's always there for us." Friedmann is a NUMBALUM who played clarinet in the Northwestern band program and was part of the SpiriTeam that kept the band and crowed pumped throughout marching season. Now, as one of the longest-tenured band announcers in college football, Friedmann is known by colleagues and students alike as a profoundly professional, caring, and ever-loyal Wildcat — the very essence of "pride and guts." 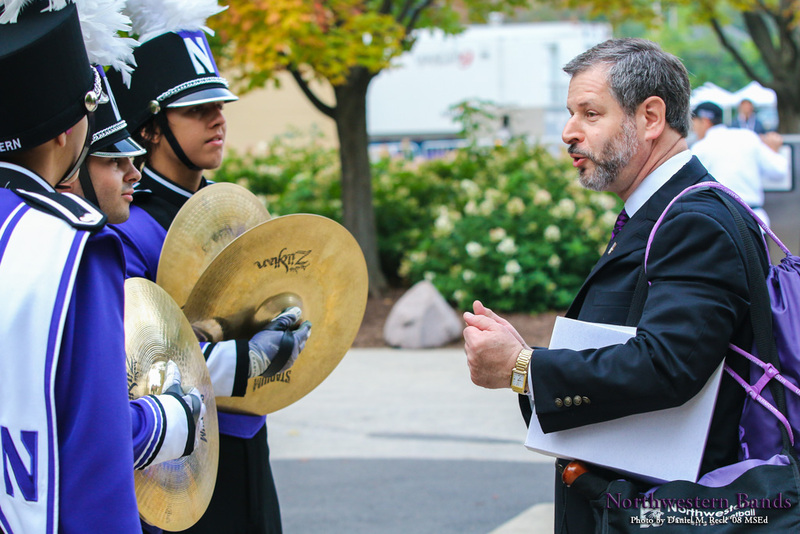 He makes a point to pull students aside to recognize their good work, as seen when he quietly complimented the Northwestern cymbal players after their performance to welcome the Wildcat team to Ryan Field on Sept. 20, 2014. Students recognized his modesty and devotion in 2013 when they inducted him as an honorary member of Phi Mu Alpha Sinfonia, the collegiate fraternal organization for musicians. Friedmann gives the same level of energy to the Wheaton Municipal Band, Schelkopf reports. "I do research the music we are going to play and try to say something about either that musical selection or the composer," Friedmann said in the Suburban Life. "I view my role as being the host. I kind of set the tone for the concert. I try to be informative for the audience, so they can appreciate the music and the performance even more." "He's kind of part of the whole experience of seeing the band," Moss said in Suburban Life.